Week ten was an eventful but excellent week of running. Came away from the Philly Rock n Roll half feeling healthy. My legs recovered quickly. The week ended with the NYRR 5th Avenue Mile and the NYRR 18mi Tune-Up. Both runs went very well! Coming out of the week feeling a bit tired but pleased with how well my body help up with the busier schedule. Monday: Rest day. Post-Philadelphia Rock n Roll half marathon. Tuesday: Recovery run. Replaced intervals with an easy run of same total mileage. Legs felt great: no noticeable soreness after the race. Now trying to pay greater attention to foot strike and running form after Philly race photos showed some pervasive heel striking. Wednesday: Cross-training. Spin for 45 minutes. Great class with Melanie G. First time spinning with her and liked the energy of her routine. Some really tough speed sessions and a killer standing arm series. Kept up with the double weights. Chi Running marathon prep class. Good one-hour session focused on form: forward lean, foot strike, and arm swing. Thursday: Tempo run at marathon pace. Opted for a hillier run by including Harlem Hill, the west side hills and two Cat Hills. Expected my legs to feel better on this run but definitely noticed some stiffness. Had a terrible knot and muscle tightness in my right shoulder. Cooler weather helped keep things comfortable, but it wasn’t until mile 6 that my body finally loosened up and felt good running. Saturday: Race. NYRR 5th Avenue Mile. Felt great racing the mile! Sunday: Long run. 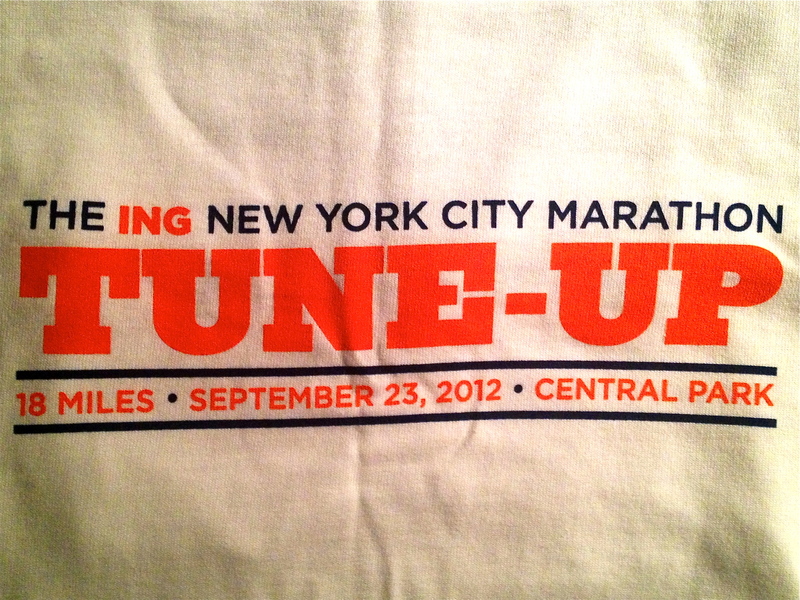 New York Road Runners 18-mile Tune-Up. After a busy week of racing and running, decided to pace this one easy. My goal was to come away from running three full Central Park loops feeling good. Enjoyed the company of a friend, which made the miles fly. Only down side to the run was some bruising of the tendons on the tops of my feet, near the ankles. Happened on an uphill (2nd Cat Hill). Re-laced my shoes which helped relieve the pressure on the tendons. Was able to run comfortably the rest of the run. Cool down & run home from finish line.